Our Goldendoodles inherit the allergy friendly coat of the purebred Poodle with the intelligence and trainability of the English Golden Retriever. At Paws of Love, we specialize in Goldendoodles, not Labradoodles. Our puppies are only sired from International Champion bloodlines of Golden Retrievers. Our extraordinary red Goldendoodles come from red Poodles who carry the non-fading gene for a beautiful deep red coat into maturity. International Champion Bloodline – We take pride in our hearty IABCA International Champion Golden Retriever sires. Our Goldendoodles inherit the best athletic and healthy genetics. Majestic Line of Red Poodle – Speak with our breeders about picking out a puppy that carries the non-fading gene. With high standards for our sires and dames, we select the Poodle with the purest genetics. F1, F1B, F2, F2B, Multi Gen – Ask us about a Goldendoodle with the perfect combination of Poodle and Golden Retriever for low to non-shed coats. Each generation offers different coat types and textures as well as personality. 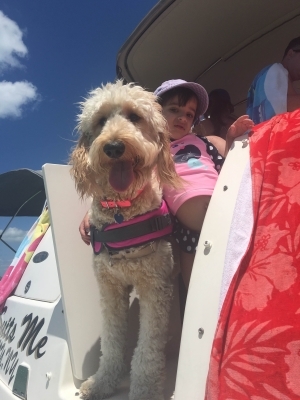 English Goldendoodle – Duly noted as an intelligent, friendly, playful, affection, and easily trainable cross breed, Goldendoodles are the perfect addition to any family with children of all ages and great for those with allergy concerns. Goldendoodle Colors and Coats – They are called designer dogs for a reason. Available in various colors from white, brown, red, and black shades, different textures, and degree of allergy relief. Our friendly and knowledgeable staff is available to answer your questions. We are passionate about Goldendoodles and care greatly about their well-being. While we have high standards for adoption, our litters are often reserved months in advance. Contact us at (786) 942-4288 to find out about upcoming litters as well as guardian opportunities.